I'll bet you've never seen lollipops like this before! Strawberries and Cream Lollipops are made with real strawberries, so they have a vibrant fruit taste mixed right into the sweet candy! 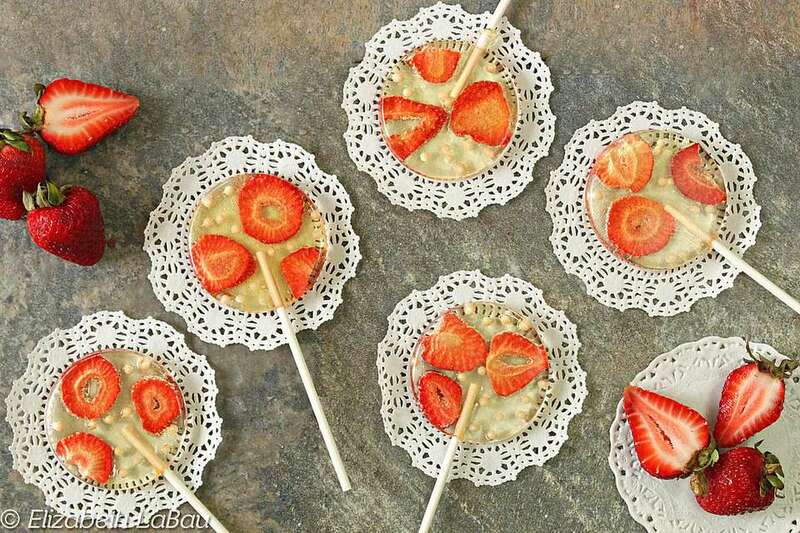 These pops have a light vanilla flavor and have freeze-dried strawberries and sugar pearls pressed right into the lollipops for an elegant, unique look. These would make perfect gifts or shower favors! Combine the water, granulated sugar, and corn syrup in a 2-quart saucepan over medium-high heat. Stir until the sugar dissolves, then wash down the sides of the pan with a wet pastry brush to prevent sugar crystals from forming. When the sugar syrup comes to a boil, insert a candy thermometer. Continue to cook the sugar syrup, stirring occasionally, until the thermometer reads 290° Fahrenheit (143° C). Once it is still, stir in the vanilla extract. Quickly, press 2-3 strawberry pieces on top of each lollipop and press down gently to embed them. Scatter the sugar pearls on top of the pops and press down to embed those as well. The lollipops will start to harden soon after they're poured, so it's important to work quickly during this step. Lollipops keep well when stored in a cool, dry environment. For best results, wrap them individually in cling wrap and store them in an airtight container at room temperature.